Some of the participants at the Acholi cultural festival. Photo by David Okema. GULU— Celebration of the Acholi cultural heritage celebration started yesterday (Thursday) with a procession from the Royal Palace, Ker Kwaro Acoli of Rwot David Onen Acana II, in Bargede division Gulu town. The celebration which ends tomorrow (Saturday) is being attended by more than 1,500 Acholi residents from districts of Acholi and others from different part of the world. While flagging off the event, Prime Minister Ker Kwaro Acholi, Ambrose Olaa, said the cultural festival aims at reviving Acholi’s lost glory eroded by the two decades Lord’s Resistance Army (LRA) war in northern Uganda. 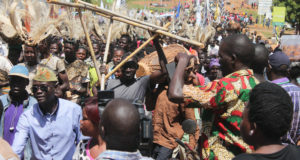 Odong Geoffrey Ojibo, director FORAMO a non-governmental organization in Gulu, said the event reminds the Acholi about their traditional custom of gathering some of the harvest at the Palace of their chief because leaders must feed people and it’s the responsibility of the subjects to contribute food stuff. Retired Bishop of Kitgum Diocese Mark Baker Ochola said the event brings together Acholi from across the world. “We have been blessed by a rich cultural heritage in terms of dance, folk laws, historical backgrounds which all speak something about us,” Bishop Ochola said. The three-day event will showcase various activities including traditional music and dances like Bwola (royal dance), Larakaraka (courtship dance), Otole (war dance) among other dances.